CHICAGO and SAN DIEGO – March 22, 2017— About 70 percent of Americans over the age of 30 think the country is “a little or not at all prepared” to address the healthcare and social support needs of its fast-growing senior population and nearly 6 in 10 believe that the efforts that are currently underway are not going in the right direction, according to a new national survey on aging released today by the West Health Institute. Additionally, when it comes to their own aging experience, Americans as young as 30 worry most about developing memory problems, facing health and financial issues and losing their independence. These are among the findings of the West Health Institute/NORC Survey on Aging on America, a survey of more than 3,000 adults conducted to contribute to the understanding of people’s hopes, fears and perceptions of aging during each decade of life after 30, conducted by NORC at the University of Chicago. These results are being presented today at the American Society of Aging 2017 Aging in America Conference in Chicago, and webcast at 2 p.m. CST. Access to appropriate healthcare, caregivers and supportive social services will become bigger issues as baby boomers age. About 10,000 a day are turning 65, with seniors expected to make up 19 percent of the U.S. population in 2030, up from 12 percent in 2000. At last count in 2014, there were 46.2 million seniors in the U.S. Losing one’s memory, developing health problems and not having financial security tie at the top for the biggest worries conveyed by Americans 30 and older. 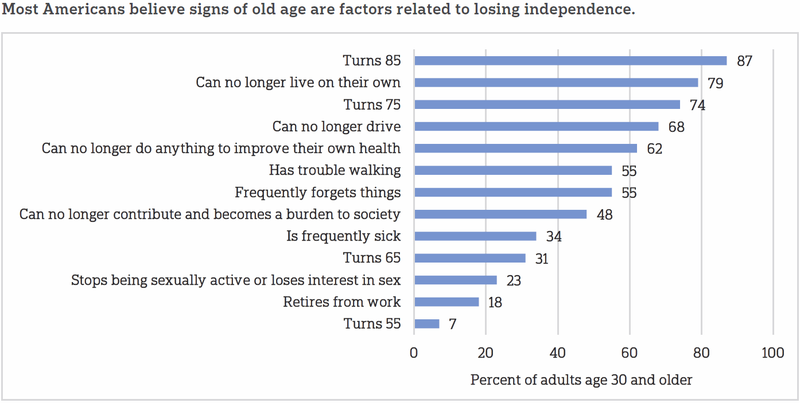 Each was a concern for about 70 percent of the people surveyed, closely followed by losing one’s independence (63 percent) or having to move into a nursing home (56 percent) — worries that persist, but lessen for people later in life. While losing memory remains a top concern, financial security takes a back seat to losing one’s independence or potentially having to move into a nursing home for people in their 70s and older, showing how maintaining independence is an important theme across the ages. Interestingly, the survey also found that as they age, people in their 30s are as likely to worry about becoming a burden to their family as people in their 60s. What do Americans think are signs of old age? For most adults, it’s less about turning a specific age and more about their independence and being able to take care of themselves. Majorities say signs of old age include when a person can no longer live on their own, can no longer drive and can no longer do anything to improve their own health. In contrast, fewer than 4 in 10 people say signs of old age include when a person turns 65, retires from work, stops being sexually active or is frequently sick. More than half of Americans over 30 report being mostly or somewhat optimistic about aging, an optimism that tends to grow among older adults. About half of people in their 30s, 40s and 50s are mostly or somewhat optimistic about aging, compared with more than 6 in 10 people 60 and older. About one-fifth of people are very or somewhat excited about aging. People in their 60s and older are twice as likely as younger Americans to say their aging experience is better than prior generations (59 percent vs. 28 percent), and more likely to say seniors get the respect they deserve (39 percent vs. 24 percent). Most Americans view baby boomers as the generation with the highest quality of life and most financial stability, while millennials are viewed as struggling in both areas. “The survey shows that more groups than just baby boomers believe the healthcare system, social services, government programs and communities should be doing more to help seniors stay healthy and retain their independence,” said Trevor Tompson, vice president of public affairs of NORC at the University of Chicago. 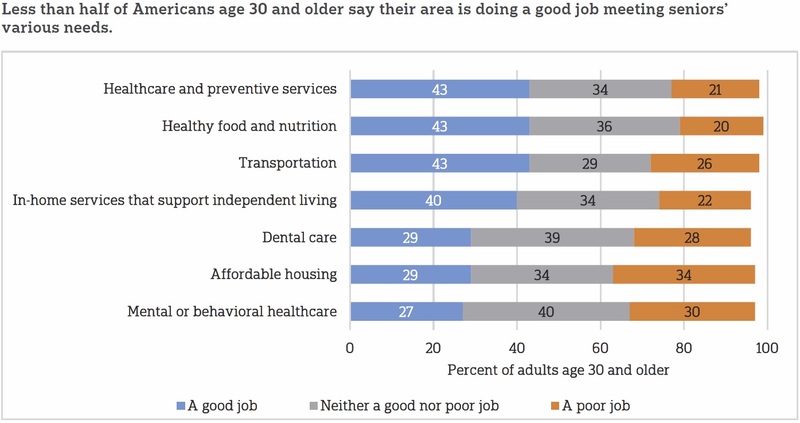 When it comes to perceptions on healthcare and social service programs meant to support aging, most believe the healthcare system and their local communities should do more to help older adults. Sixty-two percent of those 30 and older lack confidence that Medicare will continue to provide at least the same level of benefits in the future that it currently does. When asked which various institutions are addressing the needs of seniors, almost twice as many Americans (46 percent) 30 and older said religious organizations and places of worship were doing very well or extremely well, when compared with institutions like local charities (26 percent),healthcare providers (25 percent), and government programs like Social Security and Medicare (23 percent). In addition, majorities believe in-home services such as home visits by doctors or ‘house calls’ (63 percent) and telemedicine (65 percent) would be helpful in improving care, however, access to these kinds of services is extremely limited. For example, Medicare enrollees were limited to 5.2 million home visits in 2012, representing only about 12 percent of the estimated total need for that population, while only one percent of Medicare beneficiaries used telemedicine in 2014. 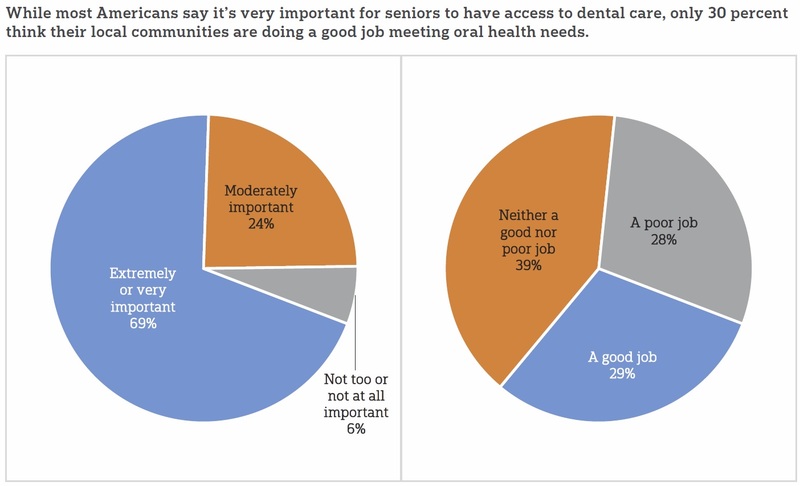 While more than 7 in 10 say it is important that seniors have access to healthcare services, healthy food, affordable housing and transportation, a notable finding was the similar ranking for dental care needs. Currently, government programs provide limited access to oral healthcare for seniors, compared to those for health, nutrition and transportation. Additionally, the survey reported that only about 3 in 10 say their community is doing a good job of meeting seniors’ dental care needs. Please click here to see an issue brief on perceptions of aging across the generationsand click here to read an issue brief outlining perspectives on communities, caregivers and the healthcare system. Please click here to view a live discussion of the survey and its findings from the 2017 American Society on Aging conference in Chicago at 2 p.m. CST today, March 22, 2017. The survey featured a nationally representative sample of 3,026 adults age 30 and older using the AmeriSpeak Panel, the probability-based panel of NORC at the University of Chicago. Interviews were completed online and using landlines and cell phones from September 19 to October 21, 2016. Results have a margin of sampling error of +/- 2.2 percentage points. More information about the survey and reports can be found here. Please click here to see the full topline annotated questionnaire and results of the survey. Click here to see a sample quality report with full demographics of the respondents and click here to see the full survey methodology. Press contact: Tim Ingersoll, tpingersoll@westhealth.org, (858) 412-8727 or (619) 871-3769 (cell); or Eric Young for NORC at young-eric@norc.org or (703) 217-6814 (cell).